Patient who suffer from acute myelogenous leukemia may present with signs and symptoms such as enlargement of the spleen and enlargement of the liver ( hepatosplenomegaly), fatigue, lymphadenopathy and bleeding from the nose or menorrhagia ( excessive loss of blood during menstruation). Acute myelogenous leukemia commonly affecting middle age and elderly people.Patient who suffer from acute myelogenous leukemia may be treated with all trans retinoic acid ( specifically for M3 with t( 15, 17) ) , transplant of the bone marrow and chemotherapy. Acute myelogenous leukemia may be divided into 8 different subgroups which include M0,M1,M2,M3,M4,M5,M6 and M7. Each subgroup is associated with specific form of neoplastic myeloid lineage with a specific level of maturation. These include myelocyte, monocyte, megakaryocyte and erythrocyte. Acute myelogenous leukemia commonly present in patient who is expose to the chemotherapy, benzene and ionizing radiation as well as patient with Down Syndrome. Certain chromosomal translocation may also lead to acute myelogenous leukemia which include M2, t( 8,21) and M3, t ( 15, 17). Investigation for acute myelogenous leukemia may include peripheral blood film/peripheral blood smear and analysis of the bone marrow. Peripheral blood film/peripheral blood smear may reveal myeloblasts and pancytopenia. Bone marrow analysis may reveal distortion of the architecture of the bone marrow and hypercellularity of the bone marrow. M3 ( acute promyelocytic leukemia ) may be associated with the present of the Auer rod. 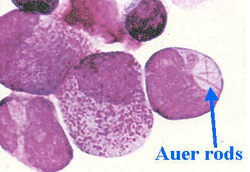 Auer rod is a form of cytoplasmic granule. Myeloblast may present specific to the subtype of acute myelogenous leukemia. 1.Shipley, Joshua L., and James N. Butera. “Acute Myelogenous Leukemia.” Experimental Hematology 37, no. 6 (June 2009): 649–658. doi:10.1016/j.exphem.2009.04.002. 2.Lichtman, Marshall A. “Acute Myelogenous Leukaemia.” In eLS. John Wiley & Sons, Ltd, 2001.